Which Handheld Computer is Best for Me? Handheld computers are all more-or-less the same, right? Not so fast. Sure, most of them share similar functions when sitting side-by-side in a climate controlled office, but there are many considerations outside of a handheld’s core duties that can be the difference between a productive working environment and that time you tried to do a Ford 351 engine swap with a $5 crescent wrench and a blurry YouTube video as a guide. Click on the image below and let’s take a look at some common data collection situations and see if we can get you pointed in the right direction. We get a lot of customers asking us for help choosing between handheld computers, so hopefully this makes things a little easier. 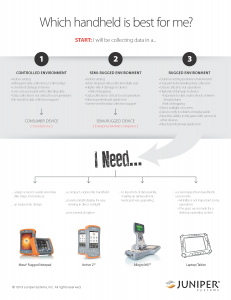 If your mobile data collection needs turn out to be more complicated than what the basic guide above covers, give us a call at 435.753.1881 or send us an email. We have a full staff of data collection experts who are passionate about helping professionals find the right tool for the job. If you are interested in future data collection topics be sure and subscribe to Juniper Systems’ blog, Get Rugged! computer is Best for Me?and it is very informative message,Handheld computers are all more-or-less the same, right? Not so fast. Sure, most of them share similar functions when sitting side-by-side in a climate controlled office, but there are many considerations outside of a handheld’s core duties,it is very informative message which can help me in future. Thank you for a very informative web site. This is very nice one and gives in depth information. . It contains wonderful and helpful posts. I have read most of them and got a lot from them.